British Prime Minister Theresa May refused to wear a headscarf during a visit to Saudi Arabia on Tuesday. The British prime minister visited Saudia Arabia, defying its strict female dress code by dressing in a dark blue button suit with her wrists and ankles covered but without a head scarf. The foreign office guidelines state, "Women should wear conservative, loose-fitting clothes as well as a full-length cloak (abaya) and a headscarf." It has been suggested that May's personal decision to not wear a headscarf was a political move to signal her view against female oppression in the Saudia Arabia. In Saudi Arabia, it is illegal for women to drive, and women cannot marry, travel abroad or have a job without permission from a male guardian. "I hope people will see me as a woman leader and will see what women can achieve and how women can be in significant positions," May said Tuesday. 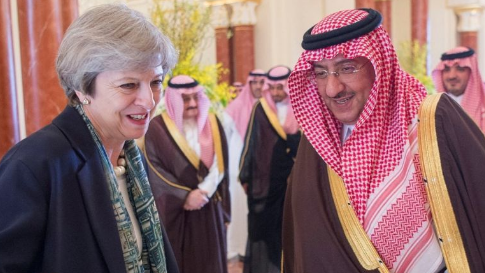 May spoke to BBC on her visit to Saudia Arabia. "The important thing for the United Kingdom when we meet people and we want to raise issues of human rights is if we have the relationship with them, then we are able to do that," May said. "So, rather than just standing on the sidelines and sniping, it's important to engage, to talk to people, to talk about our interests and to raise, yes, difficult issues when we feel it's necessary to do so." May's choice of dress is in stark contrast to that of Margaret Thatcher, who donned a long robe and hat that covered most of her hair. This entry was posted in Issues and tagged Margaret Thatcher, Saudi Arabia. Bookmark the permalink.